What sports cars can you buy for under $30,000? Sure it would be amazing to walk into a Nissan dealership and drop $90,000+ on a GT-R or an Audi dealership and drop more than a $110,000 on an R8 – however, what if you can’t afford that price tag? What if you just want a fun sports car that comes in under $30,000 but still allows you to have some fun on the road or on the track on the weekends. If you’re in this market, we’ve put together a list of sports cars that are available to you out there for under $30,000. Let’s get to it. Subaru BRZ/Scion FR-S – $25,255: This Toyota and Subaru mash-up rear-wheel-drive sports coupe is powered by a 2.0 liter 4-cylinder boxer engine making 200-hp at 7,000 rpm with a maximum torque of 151 lb-ft at 6,600 rpm. Mated to a 6-speed manual or a 6-speed automatic gearbox, 0 to 60 mph comes in 6 second flat with a top speed of 143 mph. Hyundai Genesis Coupe 3.8 R-Spec – $28,750: This Korean sports car is powered by a 3.8 liter V6 making 348-hp at 6,400 rpm and a peak torque 295 lb-ft at 5,100 rpm. Mated to either a 6-speed manual or an 8-speed automatic transmission, 0 to 60 mph in 5.2 seconds – making it one of the fastest on our list of sports car under $30,000. Honda Accord Coupe V6 – $30,350: One of the most popular sports cars under $30,000, the Honda Accord Coupe V6 is powered by a 3.5 liter V6 making 278-hp at 6,200 rpm with a maximum torque of 252 lb-ft at 5,300 rpm. Coupled with a 6-speed manual transmission, 0 to 60 mph in 5.6 seconds. Volkswagen GTI – $24,200: The Volkswagen GTI is one of the most popular sporty hatchbacks with quite a large cult following. Power comes from a potent 2.0 liter 4-cylinder turbo engine making 200-hp at 5,100 rpm and 207 lb-ft of torque at 1,700 rpm. 0 to 60 mph comes in a slow but fun 6.8 seconds. Ford Focus ST – $24,115: Ford’s Focus lineup has finally added a new sporty model with the Focus ST. Power comes from a 2.0 liter GTDI 4-cylinder EcoBoost making 252-hp at 5,500 rpm with a peak torque of 270 lb-ft at 2,500 rpm. The Focus ST is mated to a 6-speed manual allowing it to go from 0 to 60 mph 6.1 seconds with a top speed of 155 mph. 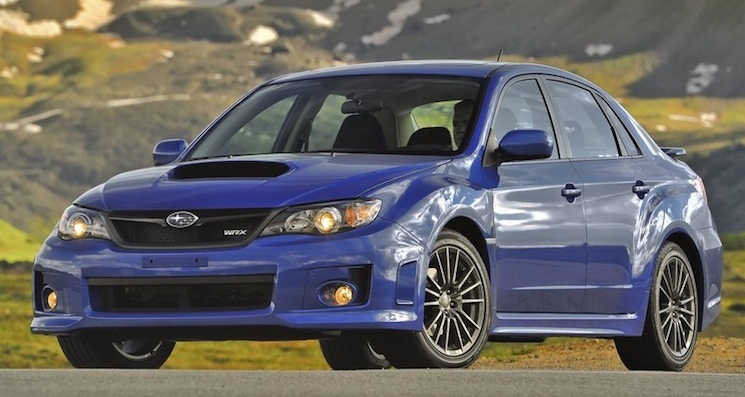 Subaru Impreza WRX – $25,795: The Subaru WRX couples all-wheel-drive and speed into one nice package for well under $30,000. Power comes from a 2.5 liter 4-cylinder turbo boxer engine making 265-hp at 6,000 rpm with a maximum torque of 244 lb-ft at 4,400 rpm. 0 to 60 comes in a very quick 5.8 seconds. Mazda MX-5 Miata – $23,720: Like the Volkswagen GTI, the Mazda MX-5 Miata is another with a huge cult following. The tiny rear-wheel-drive two-seater is powered by a 2.0 liter 4-cylinder engine making 167-hp at 7,000 rpm with a peak torque of 140 lb-ft at 5,000 rpm. Ford Mustang GT – $22,200: Starting just a little over $30,000 ($30,900 to be exact), the 2013 Ford Mustang GT offers big time V8 muscle for an affordable price. The Ford Mustang GT is powered by a 5.0 liter V8 making 420-hp at 6,500 rpm and 390 lb-ft of torque at 4,250 rpm. If you opt for the 305-hp Mustang V6, the price will start much cheaper at $22,200. Chevrolet Camaro V6 – $23,345: Unlike the Ford Mustang GT, which starts at $30,900) the V8 Camaro SS starts at $32,635 – unfortunately that’s too much to justify it a placement on our Top 10 sports cars under $30,000 list. However, buyers can opt for the V6 Chevrolet Camaro which is powered by a 3.6 liter V6 making 323-hp at 6,800 rpm with a maximum torque of 278 lb-ft at 4,800 rpm. Dodge Challenger: Last of the American muscle to make it on our list, the Dodge Challenger starts at $25,995. Power comes from a 3.6 liter V6 making 305-hp at 6,350 rpm and a maximum torque of 268 lb-ft at 4,800 rpm.